We understand that making healthy choices for you and your family while on the go can be difficult. Stopping at the convenience store for a bag of chips and a chocolate bar can easily become a habit when rushing between school and hockey practice. Despite the convenience, pre-packaged snacks often contain a high amount of sodium and sugar. The cost of convenience can also add up quickly! With a little preparation, you can easily avoid purchasing pre-packaged snack food. 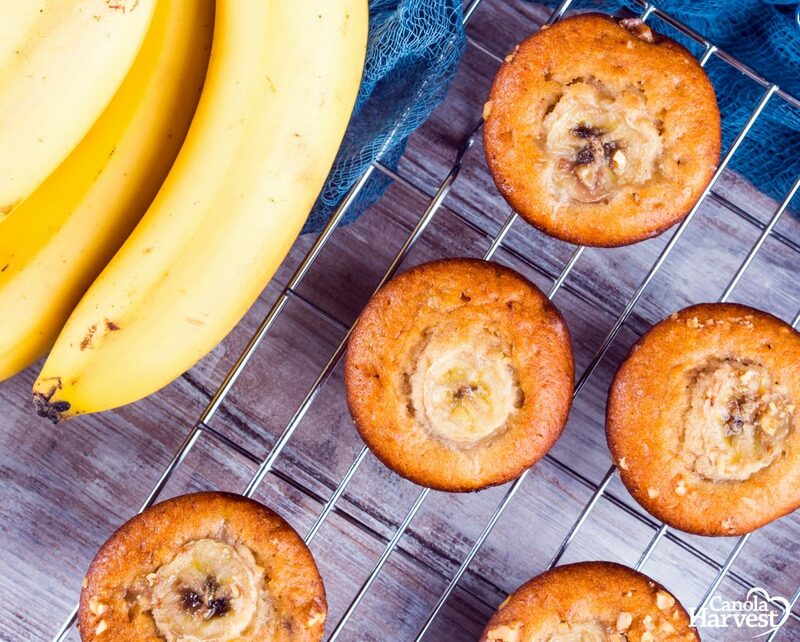 Our banana spice muffins are quick to prepare, contain a low amount of added sugar, and don’t require refrigeration! We love the simplicity of this recipe, as it calls for staple ingredients that most of us usually have in our cupboards already. Plus, by substituting butter with Canola Harvest margarine, you can reduce the saturated fat content by 80%! 1. Preheat oven to 400°F/200°C. Spray 6 large muffin cups with Canola Harvest All Purpose Culinary Spray. 2. Combine all dry ingredients except walnuts in a large mixing bowl. 3. Combine wet ingredients in a separate bowl. 4. Pour the wet mixture into the dry mixture, and stir until moistened (do not over mix). 5. Spoon into muffin tin, and sprinkle with chopped walnuts, and top with one banana slice (optional). 6. Bake for 20 minutes, until tested clean with a toothpick. Cool on baking rack.